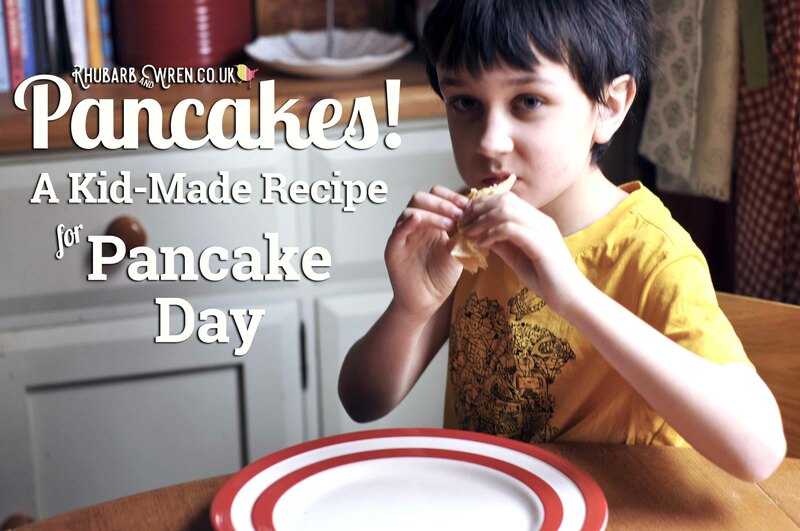 Pancake Day, or Shrove Tuesday, is the day before Ash Wednesday – which marks the start of the 40 days of Lent (the period of fasting and prayer) that lead up to Easter. As Easter is on a different day every year, so too is Pancake Day – it can take place any time between 3rd February and 9th March. The pancakes came about as they were a great way of using up those last bits of fat that were forbidden over the fasting period, and people have been eating pancakes on this day since at least the fifteenth century – as shown by the tradition dating from 1445 in the town of Olney, just around the corner from us, where local women in aprons and headscarves race each other to the church flipping pancakes in frying pans as they go. 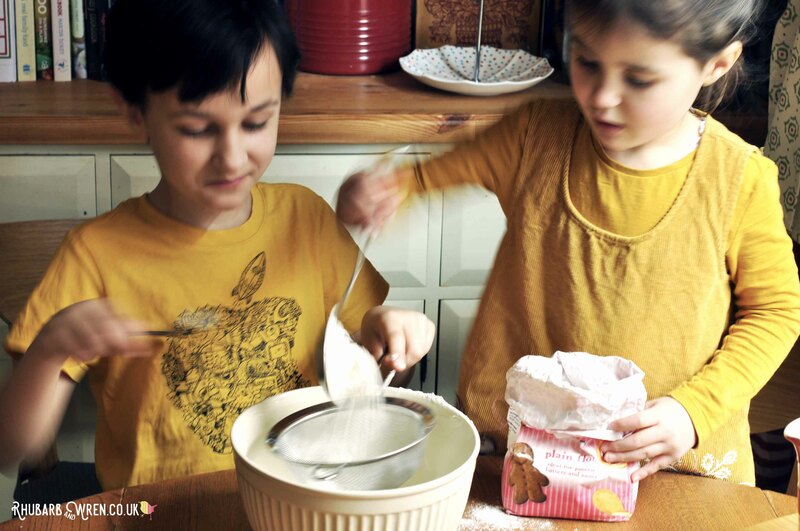 Kids love baking, and pancake batter is so easy to mix, they’ll be able to master it in no time. 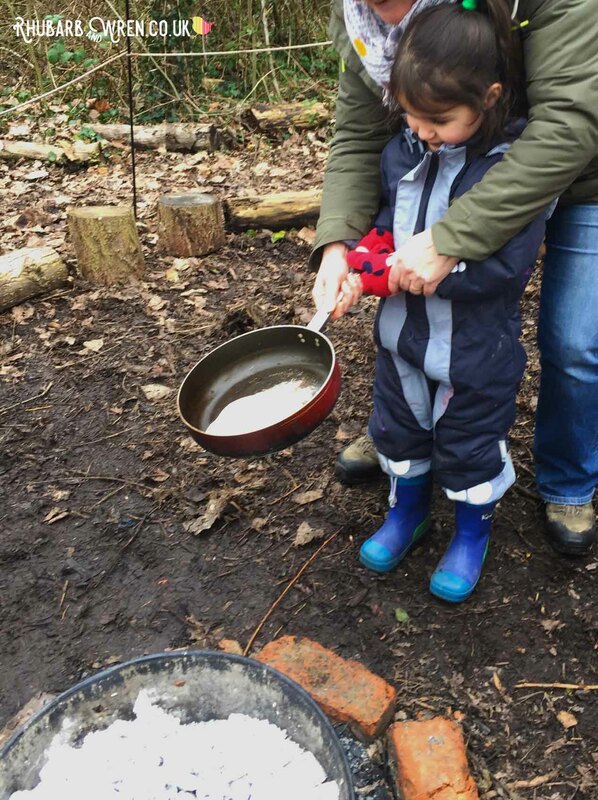 As they are so simple to cook, pancakes also make great campfire food – we’ve enjoyed many a warm, crispy, pancake dripping with syrup, while sitting round our Forest School fire. And outside the extra room to move makes it the perfect place for the kids (with a bit of help) to practice their flips. The thrill of the flip! 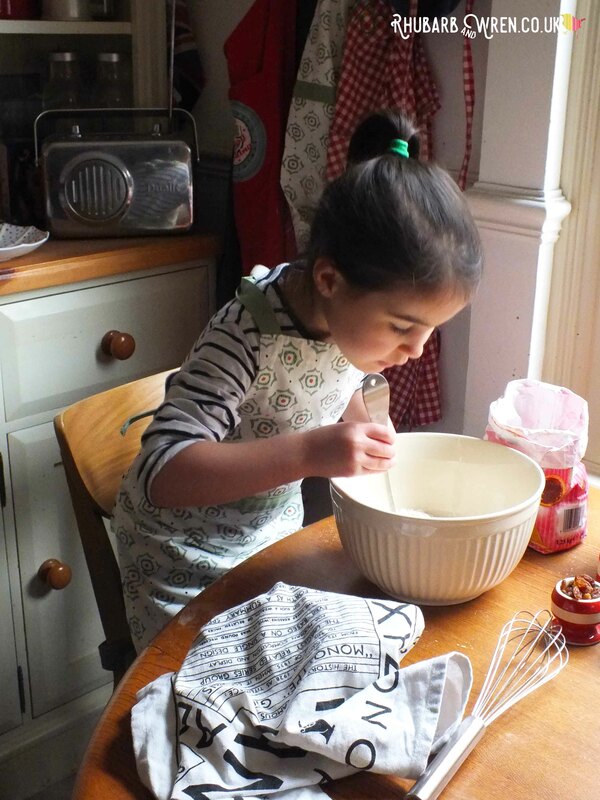 It’s wonderful to feel that we are helping to preserve a centuries-old tradition by making pancakes on Shrove Tuesday. 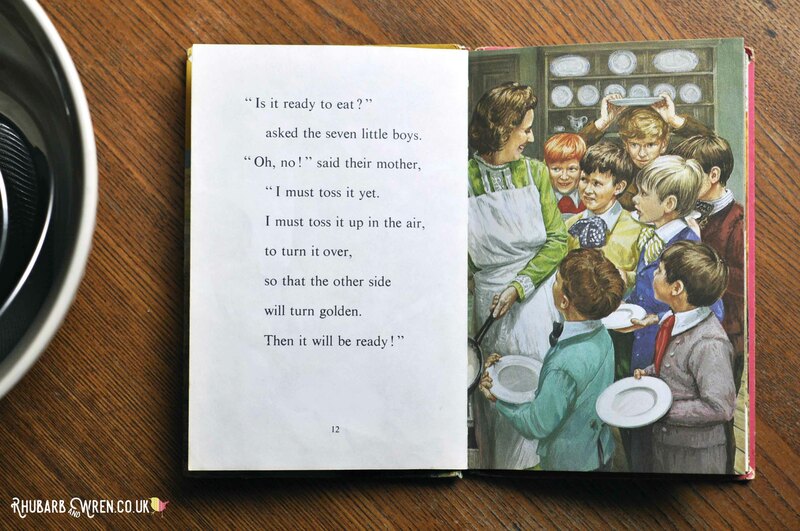 The kids and I also like to carry on a little family tradition of our own by reading together my childhood copy of the Ladybird book ‘The Big Pancake’. 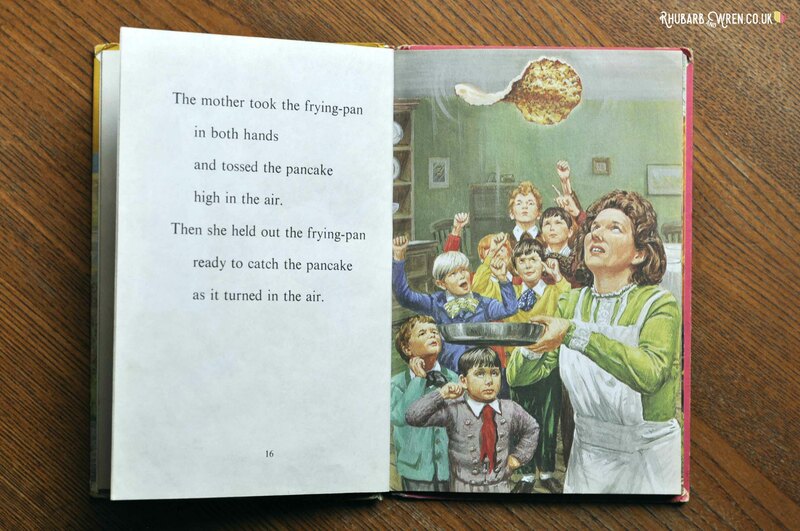 I get all nostalgic over the old Ladybird illustrations and the kids find the story of the pancake that ran away rather than be eaten by ‘seven hungry little boys’ absolutely hilarious – quite often our own pancakes try to talk their way out of being eaten after they’ve heard the story again, but two hungry little children aren’t put off for long. 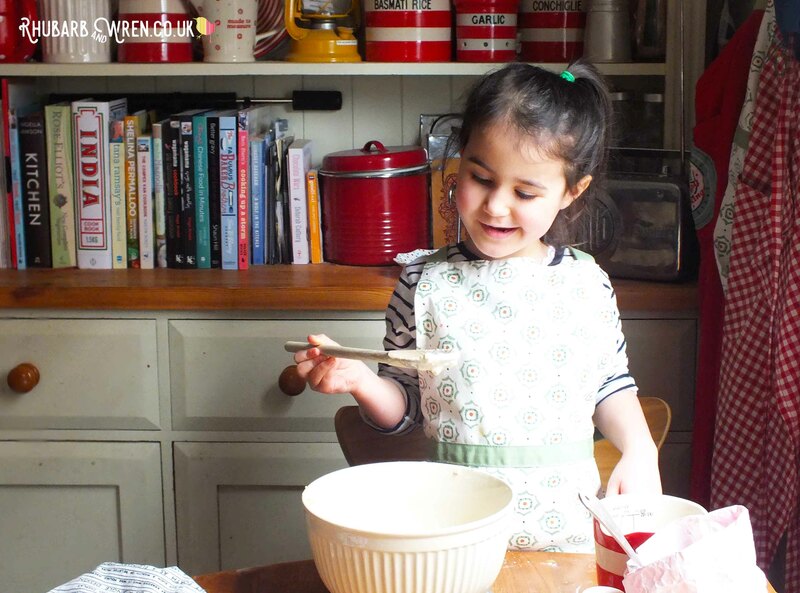 Pancakes are really, really quick and easy to make, and it is not that hard to toss them either – you may need a practice run (or two!) to get a perfect flip but once you get the hang of it, flipping is easier than turning with a spatula (which it is perfectly acceptable to do instead if you absolutely don’t want to try the toss). 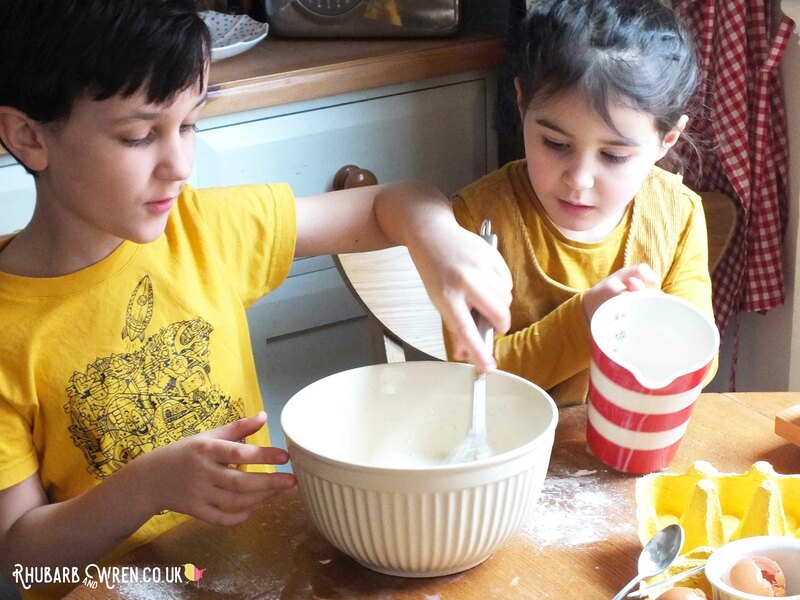 Plus you will also need a little butter or cooking oil for the pan, and your choice of toppings – we are traditionalists who like a squeeze of lemon and a little sprinkle of sugar, though the kids also love a bit of syrup (golden or maple). My mum would always sprinkle raisins onto the pancakes while the batter was still wet in the pan, but my kids and other half won’t tolerate this Welsh obsession with putting raisins and sultanas in everything, so that’s one tradition I have been forced to give up! Sift your flour into a large mixing bowl to aerate it. This ‘adding air’ stage makes it easier to get a smooth batter, but we sometimes skip if we’re in a hurry. 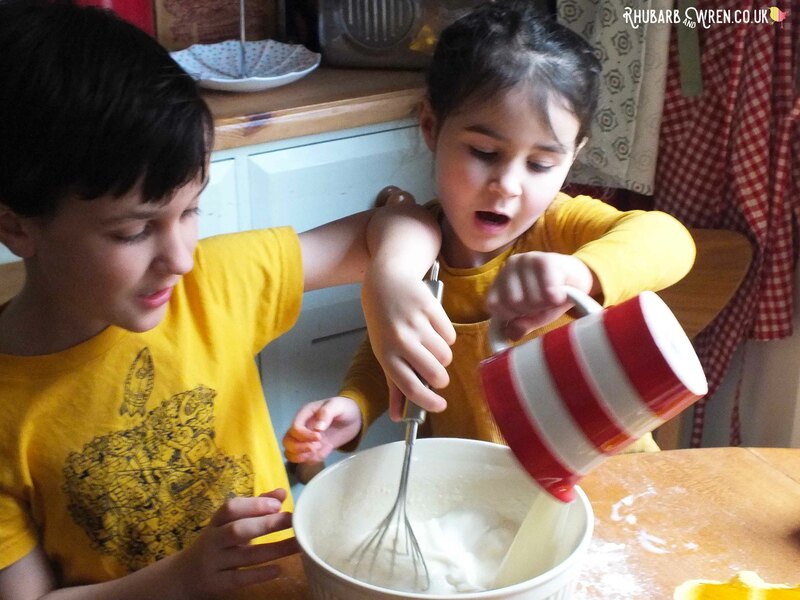 Baking with more than one child is a great way to practise team work skills! 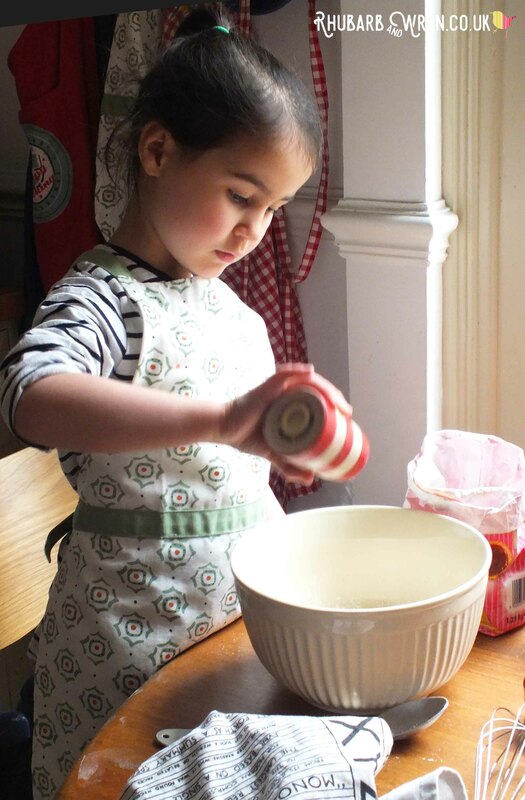 ​Add your pinch of salt and gently stir in – not too much or you’ll lose the benefit of sifting your flour. 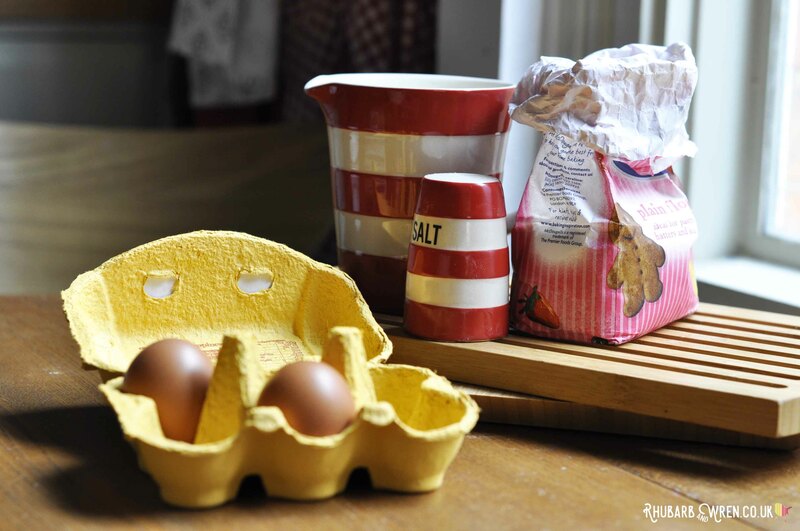 Make a little hollow in the centre of your flour, and then add your eggs (don’t stir yet!). We crack our eggs into a separate dish and add one at a time , so no bad eggs can spoil our mixture. 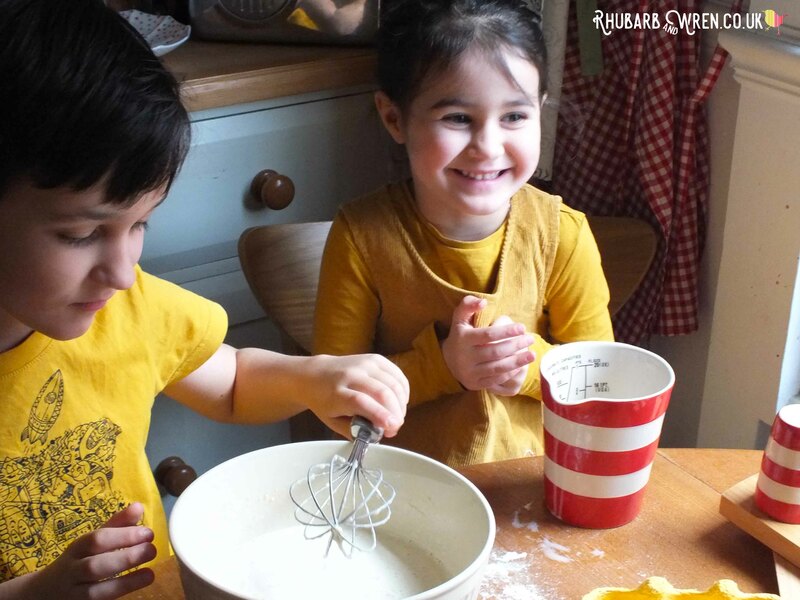 Add a splash of milk and then mix gently with a whisk (ignore the wooden spoon in the pictures – someone was very insistent about using that! ), adding a little more milk as you go, until you have a very thick but liquid mixture. 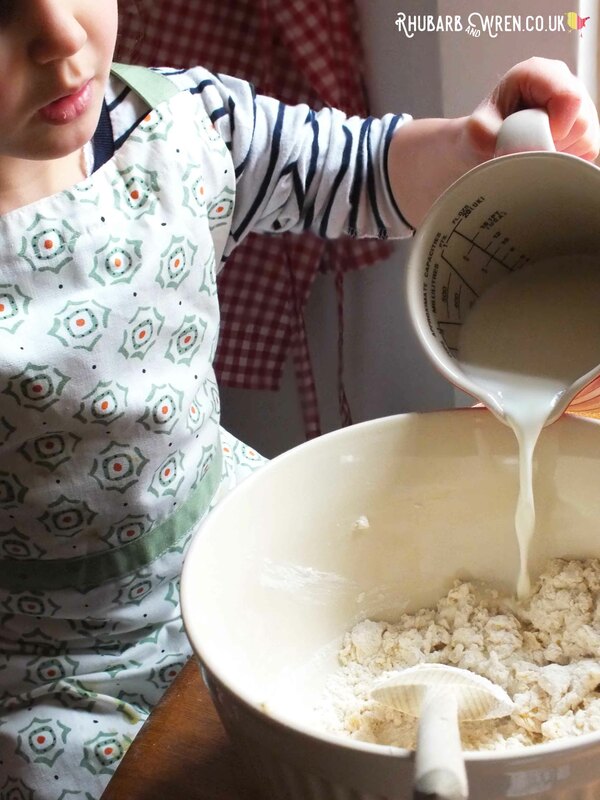 Adding milk to the batter. I find the final batter can be a little lumpy if you stir the eggs in with no milk at all, or if you add the milk all in one go (see picture below for what NOT to do), so take it slowly and start with just enough liquid to get the whole bowl of flour a little bit wet – just like mixing up the paste of cocoa powder and milk for hot chocolate. Uh oh! Adding the milk gradually… or not! ​Once you have a smooth, liquid consistency with no lumps, start whisking in the rest of the milk. It’s much easier to get rid of lumps BEFORE this stage, so get your thick mix as smooth as possible first with some good whisking. Once the liquid is all combined and your mixture has the consistency of single cream, you are ready to cook! Happiness is a bowl of runny grovels. Use a high heat to get your frying pan really hot, then turn down to medium and add a little butter or oil to the pan. Make sure to tip it around so that the entire pan is well coated – the butter should slide around easily, but watch that it doesn’t burn (if it goes brown, tip the butter out and start again). You will need to repeat this step before every pancake to make sure they don’t stick. 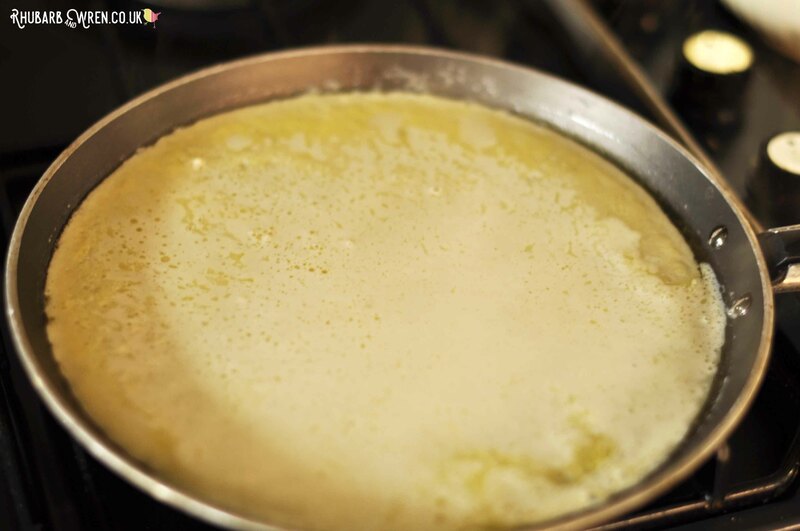 ​Use a scoop, ladle or cup to pour enough batter into the pan to cover (with a bit of tipping and tilting) the bottom completely, BUT only with a thin layer – roughly 50ml works well for my pan but it will depend on how big your frying pan is. You can add a little bit more batter to fill any holes if necessary – better to do this than have too much batter, as a pancake that’s too thick won’t cook properly and will be harder to flip. Cook the pancake over a medium heat. After about a minute, run a palette knife or spatula around the very edge to loosen the pancake from the pan. After few minutes cooking, the pancake will shrink a little and the edges will start to pull in. As it cooks, the batter should go slightly translucent and less pale, and it’ll bubble like it’s about to birth a gremlin… don’t worry – this is a good thing! It’s a sign the underside is about done. Lift an edge with your palette knife or spatula to see if it’s ready to turn. The pancake should lift easily and be slightly stiff (if it’s still limp, it’s not yet cooked enough on the under side). You should also see a nice golden colour. At this point, give the pan a little shake and use your spatula/palette knife (if required) to make sure that the pancake can slide freely in the pan. It’s time to turn that sucker! 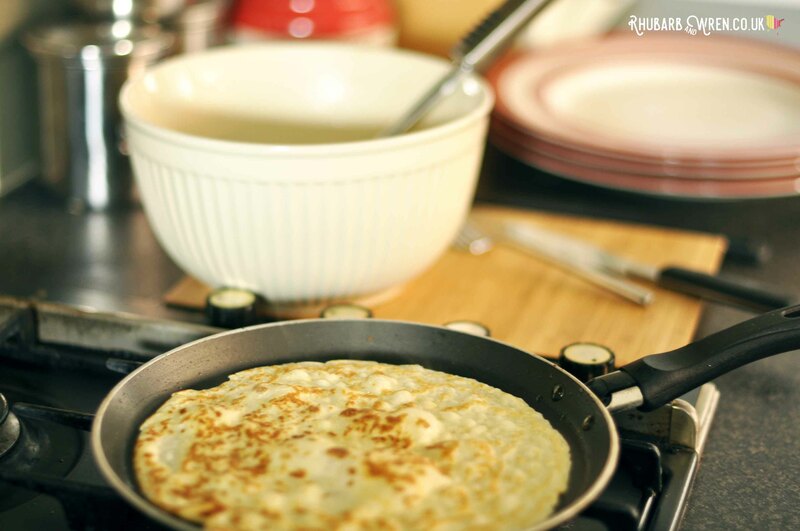 We were too busy trying to catch the pancake to photograph the flip… but ours went just like this! EITHER use a spatula to turn the pancake OR steady your nerve and go for the flip… It’s honestly not that hard so give it a go. If you really are nervous about it, try with a pancake that’s already been cooked on both sides as this makes it easier. 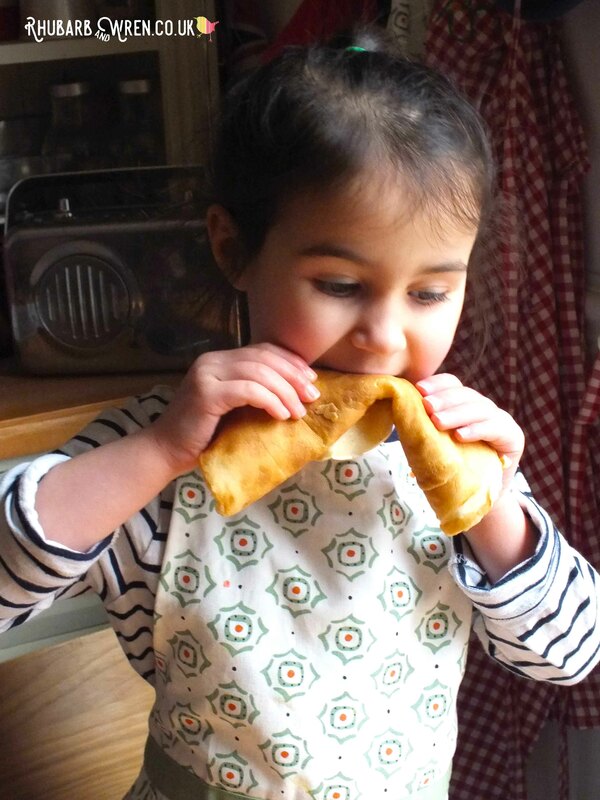 And if the pancake ends up folded (happens to the best of us! ), just use your spatula/tool of choice to gently straighten it out. Golden brown and almost ready for eating! 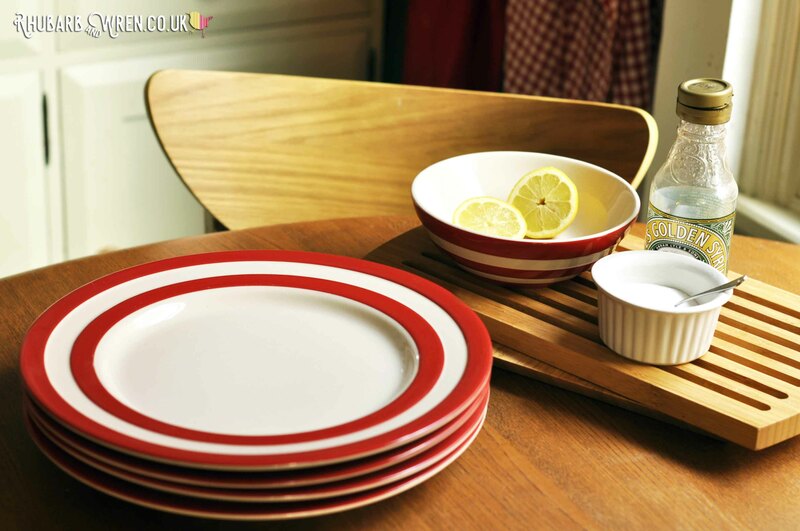 Don’t stack the pancakes, stack the plates – eat ’em as they cook, while they’re still hot! 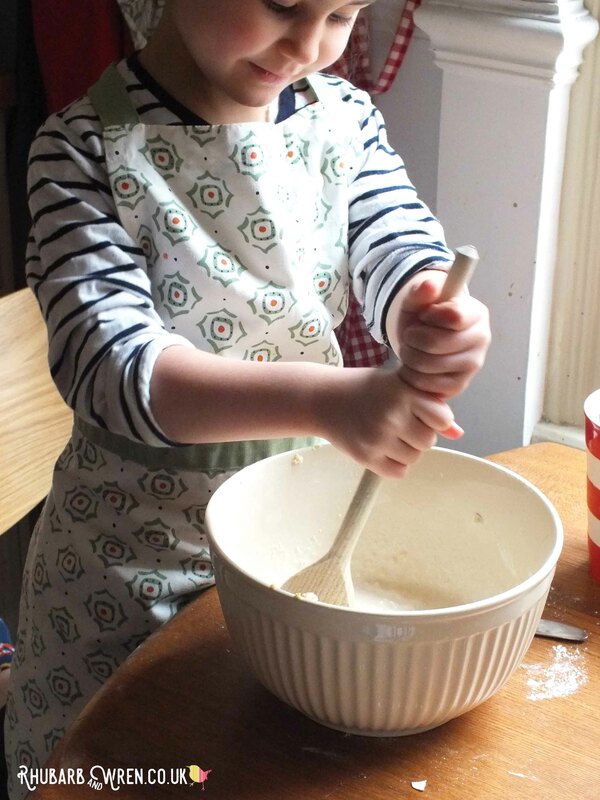 Yummy pancakes – who could resist them? You don’t need much to make pancakes, but if you’re looking to get the full kit, here are some suggestions. A good, non-stick frying pan is essential for making pancakes, and you can pick up crepe-specific pans very cheaply. 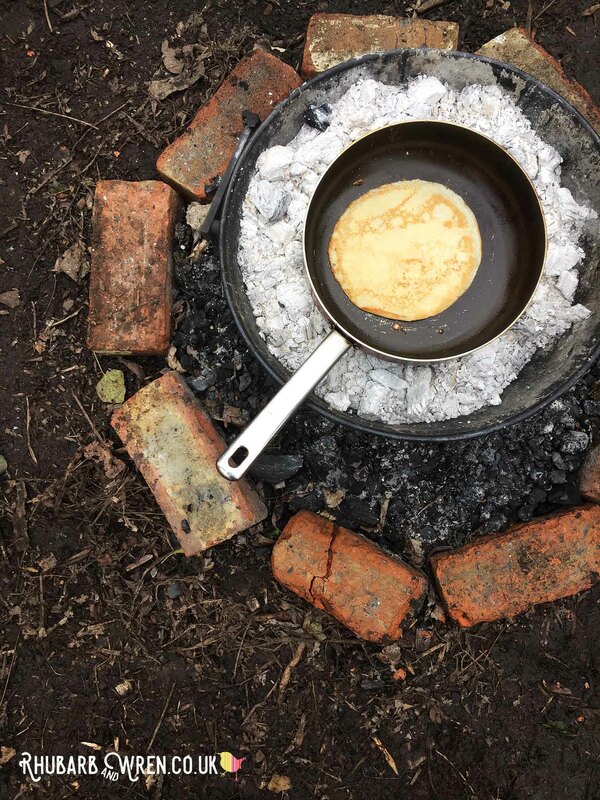 If you want to splash out, a cast iron pan like the Lodge one below would be great – but it will need seasoning (oiling regularly) before it’s fully non-stick. The wooden spatula/pancake turner is a must if you’re serious about your pancakes, and the pancake spreader will make smoothing out those pancakes a cinch. ​The following Amazon suggestions are affiliate links, which means that if you click through and buy, I will receive a small amount that goes towards the running of this website without costing you a penny extra. 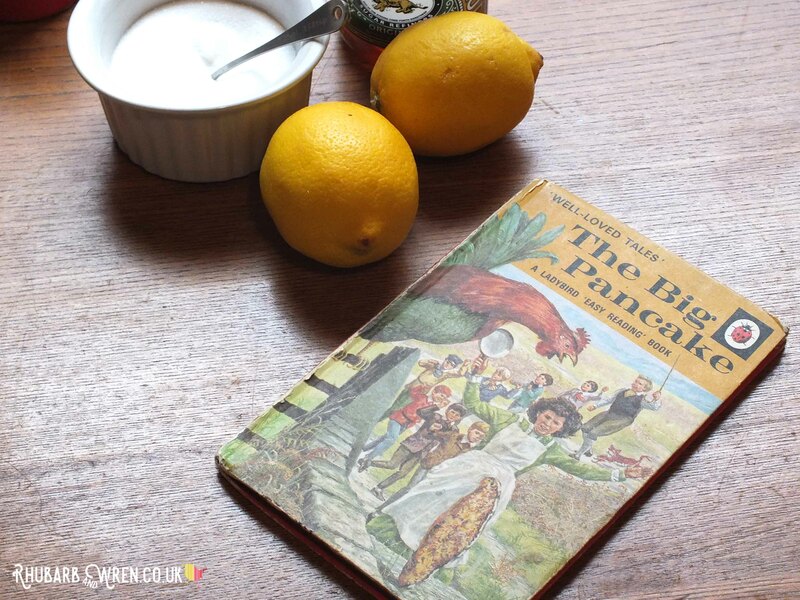 We love our Big Pancake vintage Ladybird book, and you can pick up your own copy on Amazon – I love the original illustrations but there is an ‘updated’ edition too. Other favourite pancake books are the classic Eric Carle’s ‘Pancakes, Pancakes!’ and ‘Mr Wolf’s Pancakes by Jan Fearnley (a twist on traditional fairy tales). 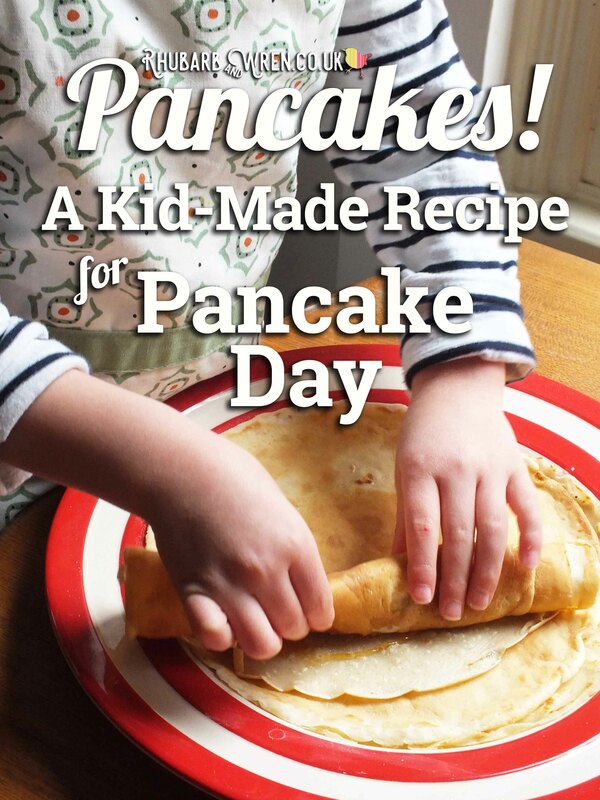 And for the fiddly child, the Interactive Cookbook is a fabulous bit of paper engineering that lets you ‘cook’ a pancake within the pages of the book with all sorts of clever bits to pull, twist and open. 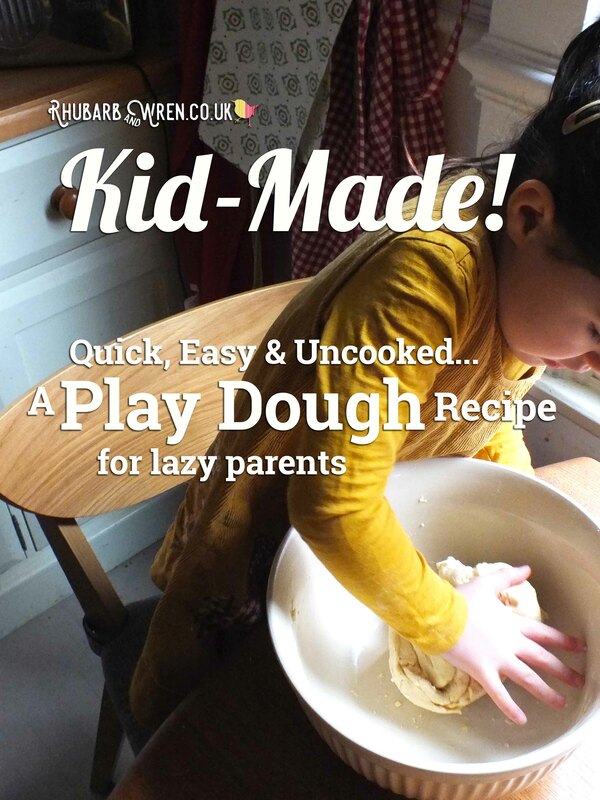 Looking for more fun things to do with the kids? Check out some of my other posts! 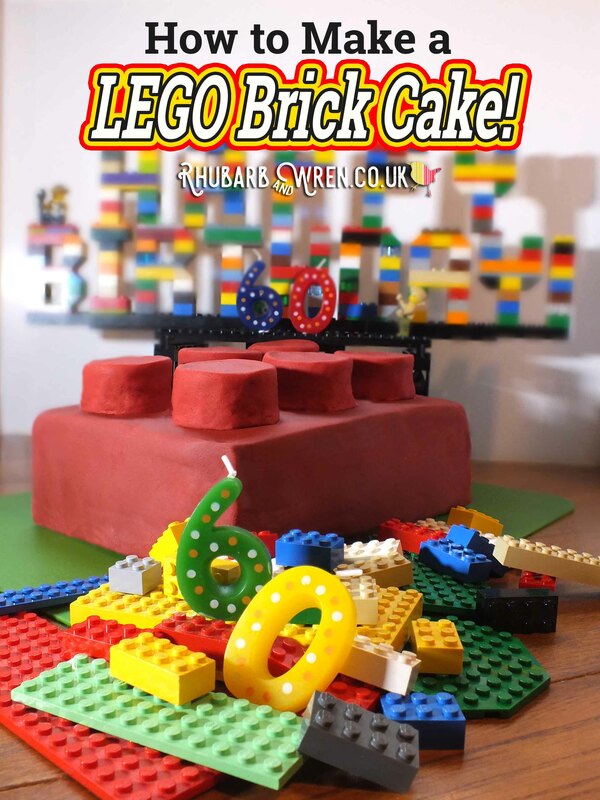 We love Lego, and so we made it a cake!